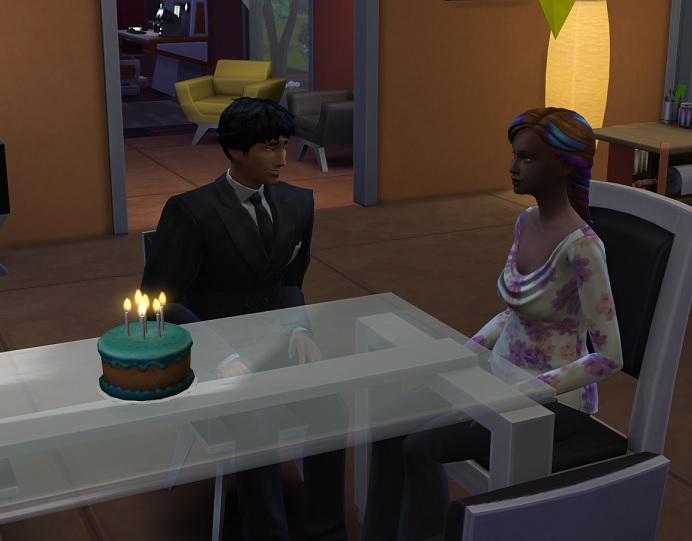 It started with Elise having a low-key birthday just with Holdem (though that was followed by some spaceship woohoo we won’t talk about). She just passed into adulthood, and I didn’t think there was a great deal there to mark. Besides, everyone else was asleep; Elise and Holdem both have jobs with late-night schedules, so they’re often mooching about in the quiet house by themselves, which suits loner-Elise just fine. After that, everyone decided they should age up pretty much on the same damn day, and I don’t mean just the triplets. Seems Slapjack and Ratscrew also want to celebrate right-the-hell-now, so I obliged and had Slaps bake himself a strawberry cake, then celebrate quietly at home with the family — with the exception of Holdem who was busy being James Bond and bringing home gold-plated bacon, by which I mean the $4000+ Simoleons he earns every time he goes to work. Ratscrew reached the pinnacle of his Space Ranger (Astronaut) career and now brings in almost as much for almost 20 hours less work a week – he’s earning $11,816 a week for 28 hours compared to Holdem’s $12,780 a week for 45 hours. And since Elise earns over 6k/week (and that’s about to go up when she hits level 10 of her career, next time she goes to work) and Slapjack earns $4,200 for a measly 15 hours (he’s also about to hit level 10) even without selling most of his paintings, the Mirage family is basically rolling in cash. Gone are the days of living without walls, sinks, counters and other mod cons. In fact, I just bought the top-of-the-line 10-grand bed and the 13-grand cooker, just to be using up some of the $80,000 the family had lying around. 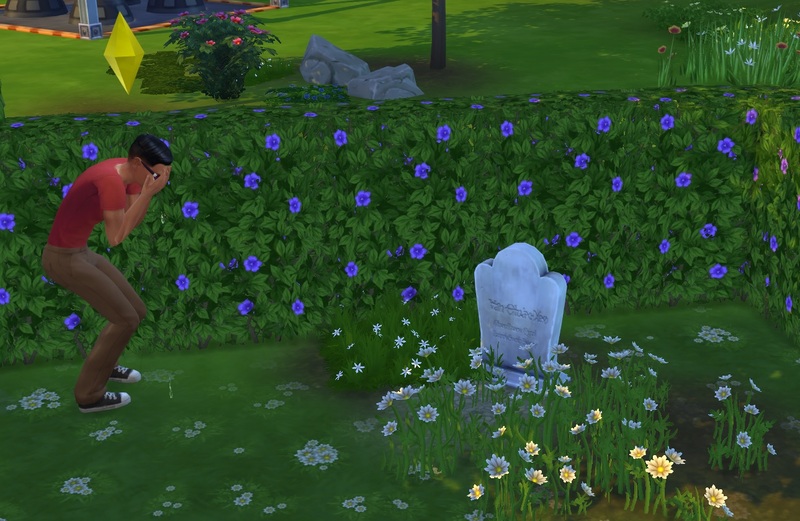 Parcheesi would be proud of her boys, and I’m still a little miffed my chance of bringing her back into the family as a ghost got bugged. But life goes on, if not for Parcheesi. Slapjack just aged up to adult while his twin Ratscrew will age to Elder, because Slaps took a potion of youth and Rats didn’t. He considered it as his elderhood started to loom, but he feels he’s had a pretty full life and he’s not sure he wants to live forever, or even for that much longer. Neither does he want to have Derek hanging around as a ghost — they did get it on, ghost-style, the other night, but it was all a bit weird for Rats who seems to be fairly square despite being a super hot-shot space ranger. In fact, he looks rather sad most of the time these days. 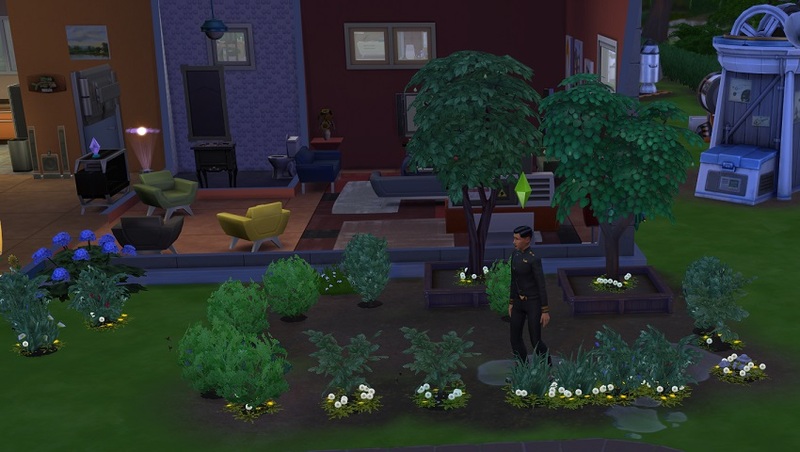 He works out, gardens, explores the galaxy and hangs out with his peeps, but it seems that with his soulmate gone (who was a bit shallow and not that interesting, but who am I to judge) he’s lost most of his joie de vivre. I expect he’ll have a quiet elderhood and ask the others not to plead for his life, so he can join Derek in the great beyond. 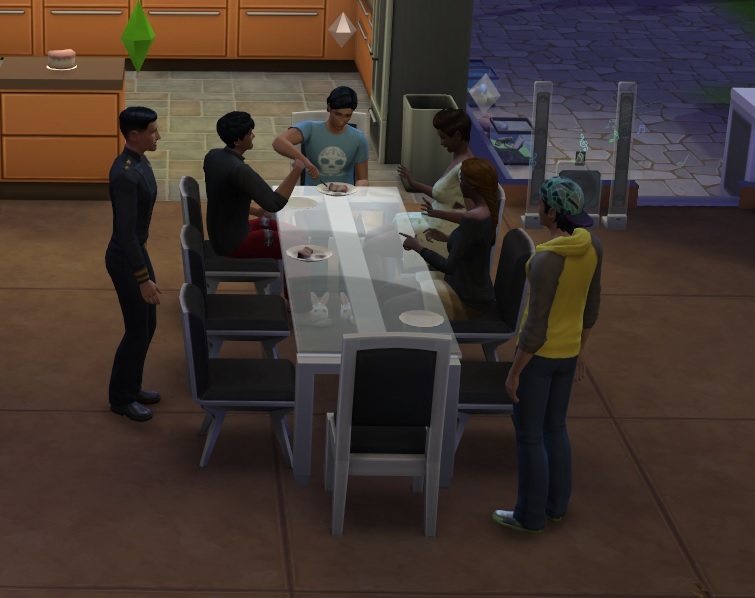 The trips are due to age up inside the next couple of Sim-days, and they’ll probably throw a large bash — assuming the game hasn’t killed all of their non-household relationships. As it is, half the household now barely knows the other half, and socialisation efforts don’t seem to be doing much to mend what seem to be permanently-broken relationships. I don’t see how it can be anything other than a bug, because the Mirage family was actually pretty tight-knit for being so large and they do a lot of socialising with each other. Oh well. Tune in next time for the great triplet birthday-now-get-out-and-find-your-own-place PARTAY!